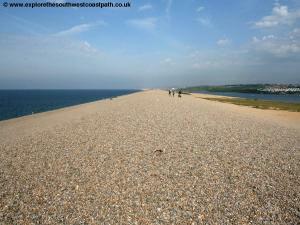 The official route of the South West Coast path follows the fleet behind Chesil Beach. 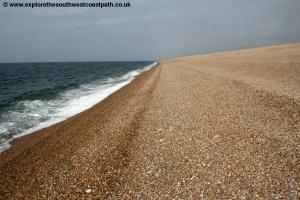 This walk provides an alternative by following the shingle bank of Chesil Beach along the coast. This is a remote but beautiful walk along this remote and unique beach. 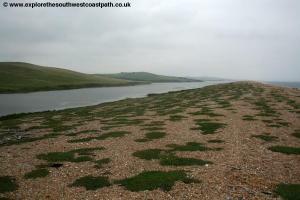 Note that this walk is very tough, being almost all on the shingle bank and once on Chesil Beach there is no option to cut the walk short. Also the beach is not accessible to the public between 1st May and 31st August. In addition there is a military firing range at Chickerell. When this is in use no access is possible along the beach (there are huts on the beach which should be manned when firing is taking place). It is therefore advised to check first as you don't want to be turned back part way. This walk is recommended to be started from the Weymouth end as this is closest to the firing range and means if the firing range is in use and you have to turn back you will find out sooner than if you started at Abbotsbury. 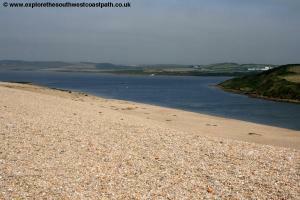 The walk described below begins from the centre of Weymouth, but as the walk is tough you may prefer to start from the visitor centre just south of Ferry Bridge on the road out to Portland to cut the stretch of the walk from Weymouth. There are regular buses from Weymouth to the north edge of Ferry Bridge, as all buses out to Portland go this way. 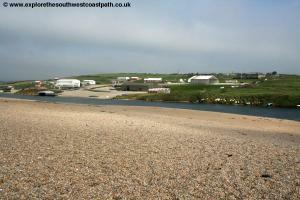 If you are starting the walk from Weymouth it is easily reached from the main east-west A35 trunk road. From the roundabout on the Dorchester by-pass take the A354 signed for Weymouth and Portland. This road has recently been upgraded and now bypasses Upwey and Broadwey which used to be a very congested section of the road. Follow this road to the centre of Weymouth and there is a large car park (Swannery Car park) just south west of the station near the visitor centre for Radipole Lake. Note however that car parking in Weymouth is expensive and you may prefer to use the park and ride service, which is considerably cheaper. This is well signed off the A354 just north of the town and it currently costs £1.50 to park with the bus to the town being free. 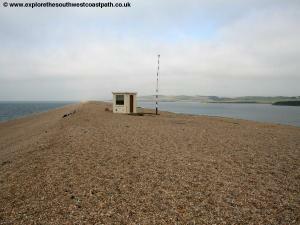 If you prefer to start from Ferry Bridge as you approach Weymouth continue to follow signs for A354 to Portland. Once through Wyke Regis you come onto the main road onto Portland, Ferry Bridge. Park at the visitor centre which is on the right just as you leave Wyke Regis and cross over the bridge. There is a pay and display car park at the visitor centre (as well as a cafe and toilets). If you are coming by public transport, Weymouth is well served. Trains run twice per hour (hourly on Sundays) from London Waterloo to Weymouth via Winchester, Southampton, Bournemouth, Poole, Warehamd and Dorchester as well as numerous smaller stations. These trains are operated by South West Trains In addition there are trains from Bristol to Weymouth via Bath, Bradford-on-Avon, Trowbridge, Westbury, Castle Cary, Yeovil and Dorchester operated by Great Western Railway. In addition there are regular buses from Portland to Weymouth. Longer distance bus service also operated to Weymouth including the 31 service from Axminster via Bridport and Lyme Regis and the X53 service from Exeter via Seaton, Lyme Regis, Bridport and Abbotsbury. If you prefer to start at the visitor centre off Chesil Beach, any of the regular bus services out to Portland pass the visitor centre although I don't think there is a bus stop at the centre. 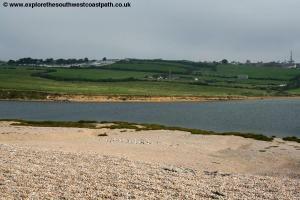 It is best to alight at the Ferrybridge Inn pub at the south edge of Wyke Regis from where it is a 5 minute walk. 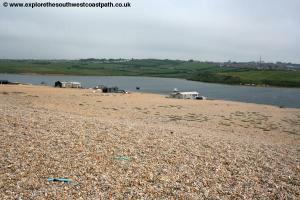 Weymouth is a large town and a popular holiday resort and as such as a large variety of accommodation from camp sites and caravan parks to large hotels. 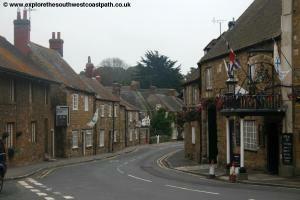 The choice in Abbotsbury is more limited as it is only a village. See the links below for details. 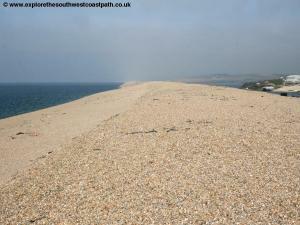 Note that this walk is not possible from 1st May - 31st August inclusive, due to nesting birds on Chesil Beach. Please respect this and do not attempt this walk during this period. 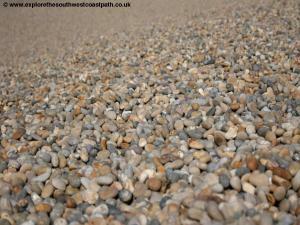 From the centre of Weymouth, head along the beach, with the sea on your left. On reaching the pier continue until you come to the Condor ferry terminal. Here turn right to reach the mouth of the river Wey and the beautiful harbour. Turn right, keeping the water on your left and continue ahead through the pretty old town until you reach the Town Bridge. Go up the steps onto the bridge and cross it and once over turn left along Trinity Road into the pretty old town. Look for steps up to the right into Nothe Gardens and take these to get fine views over the harbour and town. 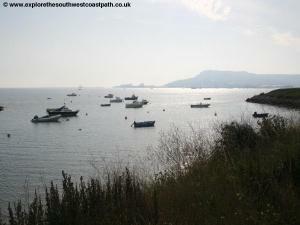 Follow the signed path through the gardens to reach the south of this little peninsular and Newtons Cove. There is a new promenade along the back of this beach and as you approach the ice cream kiosk take the path on a bridge over Newtons Road and continue on the path ahead. The coast path used to run along the coast here, but a land slip has closed the path and you must instead divert onto the road. From the bridge take the tarmac path south with houses on your right and grass to your left. Follow this as it turns a little to the right to join the road of Redcliff View. Turn right onto the road (more or less straight on) and take the first turn on the left, Belle Vue Road. This is a quiet residential road but lacks a pavement in places so take care. At the end of Belle Vue Road turn left into Old Castle Road. Follow this passing the park at Sandsfoot Castle on the left. From the end of this road follow the footpath ahead passing a large boat club and then joining the Rodwell Trail, which follows the old railway line that went out to Portland. Keep to the Rodwell Trail passing an area of new housing on the right and then coming to a little harbour. 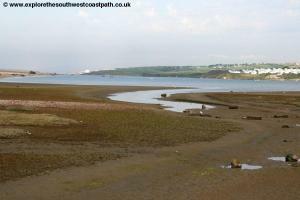 Take the path along the back of this harbour (Small Mouth) and then at the Ferry Bridge Inn pub at the main A354 road turn left. Cross Ferry Bridge to reach the Chesil Beach visitor centre on the right, which has a cafe and toilets. 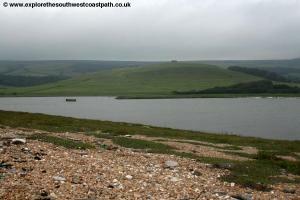 It is wise to ensure you have plenty of drinking water as there is no facilities at all and no road access until you reach Abbotsbury and the walk is tiring. 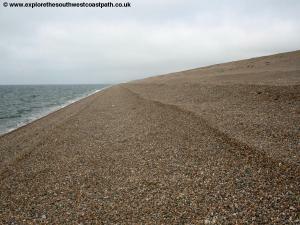 From the back of the visitor centre take the board walk path out onto Chesil Beach and continue when the board walk ends up onto the shingle bank. From here you have wonderful views of Portland ahead and Portland Harbour, which hosted the sailing events of the London 2012 Olympic Games and Paralympic Games. 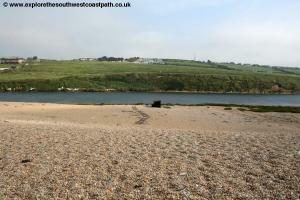 On reaching the beach the directions for the rest of the walk are simple â€“ turn right and keep the sea on your left! 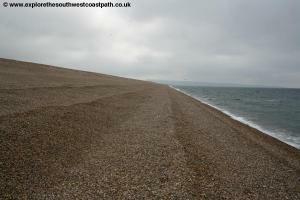 You can walk along the top of the shingle bank or closer to the shore line (but take care for large waves, which are common here). The views of the Fleet are wonderful and you can watch as Portland gradually gets further away. 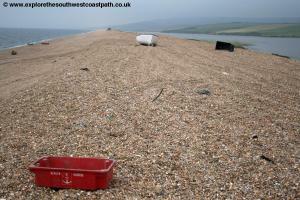 Sadly Chesil Beach gets much debris washed ashore so you'll often find bits of wood, old fishing nets and litter which is a shame. 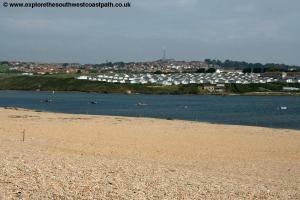 You can see the numerous fishing huts on the Fleet side of the beach as this is a popular location for beach fishing. Soon you pass the Wyke Regis training area military camp on the right. About half a mile beyond here you come to the start of the Danger Area. The beach up to this point is access land. Beyond here access is permissive only. 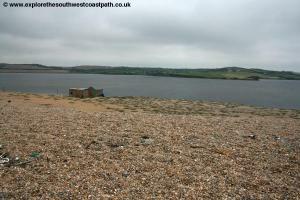 As you approach the firing range you will see a hut on the beach. A red flag should be flying here if the range is in use. If this is the case DO NOT PROCEED. You will have to return to Ferry Bridge. The hut may also be manned in which case you may be able to enquire how long the range is in use for. 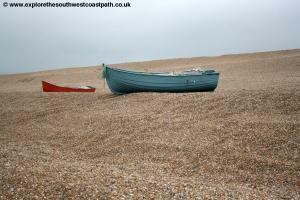 Assuming it is not in use, continue on the shingle bank. The rest of this walk is tough. Not because of steep gradients so much as just walking on the lose shingle is hard work so you should ensure you have plenty of food and drink and allow plenty of time. 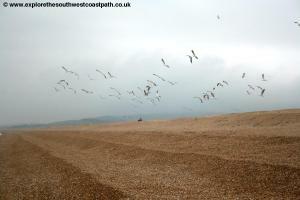 The view from the top of the Shingle bank is over the fleet whilst along the shoreline there are often large bird colonies. It is very likely you will see only a couple of fisherman for the rest of the walk and perhaps no one at all. 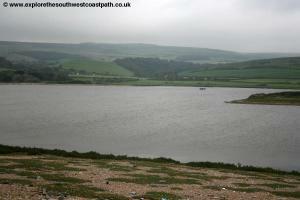 As you approach Abbotsbury you should be able to see St Catherines Chapel on the top of Chapel Hill to the right and the swans of Abbotsbury swannery in the fleet to the right of the beach. 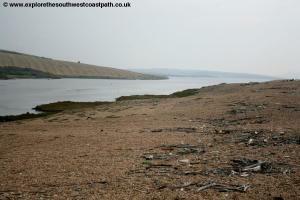 Note that the signage for access to Chesil Beach is rather ambigious. As you approach Abbotsbury you will pass a sign saying 'No access east' where you have just come but just beyond it another sign saying you can walk along the beach outside of 1st May - 31st August period and another saying that you are allowed to use the beach for â€œangling and quiet recreationâ€ so it seems access is permitted despite this odd 'no access east' sign. 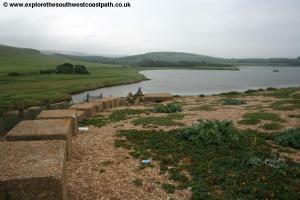 As you approach Abbotsbury you come to the car park along the sea front. From here you take the bridlepath to the right, heading back due east initially and then turning left in land. 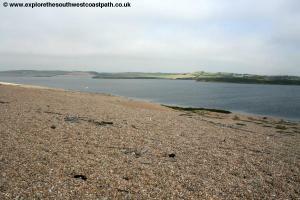 The path soon splits, with the official coast path going to the right along the south edge of Chapel Hill. DO not take this but continue ahead on the bridlepath. Ignore the two paths off this signed to the left and continue until the bridlepath comes to a T-junction. Here turn left on the bridlepath going north with views of the church to the right and emerging ahead onto the main street of Abbotsbury beside a shop where the walk ends. From Abbotsbury bus service X53 (The Jurassic Coastlinx bus) runs roughly once every two hours, seven days a week back to Weymouth. This is operated by First Dorset and takes around 30 minutes to get back to Weymouth. If you parked at the visitor centre on Chesil beach any of the buses back to Portland will stop at the Ferry Bridge Inn, a short walk from the visitor centre (note that the road south from here is a clearway so buses cannot legally stop until they arrive at Portland). Bus 1 is described in the timetable as operating 'at frequent intervals' during the day (typically I think at least every 10 minutes) and every 15 minutes on Sunday. 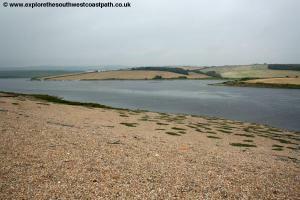 It takes around 15 minutes from Weymouth. This bus is also operated by First Dorset. Here are some photos of the walk. Click each photo for a larger version. 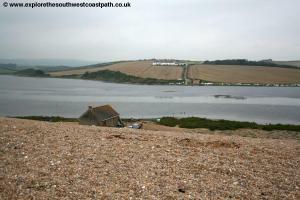 Ordnance Survey map OL15 covers Chesil Beach, Weymouth and Abbotsbury and is widely available both locally and nationwide. See the links below for a map of the walk.